At the tail end of cauliflower season, I’ve had enough of bubbly, gooey gratins. With spring just around the corner, I wanted to use what might be the last of our local cauliflower for something with more zip. I found a marinated cauliflower salad from Bon Appetit’s November 2003 issue, and that was just the inspiration I needed. Of course, I made a few changes by including carrots, switching up the olives, throwing in some capers, and adding some heat with crushed red pepper. 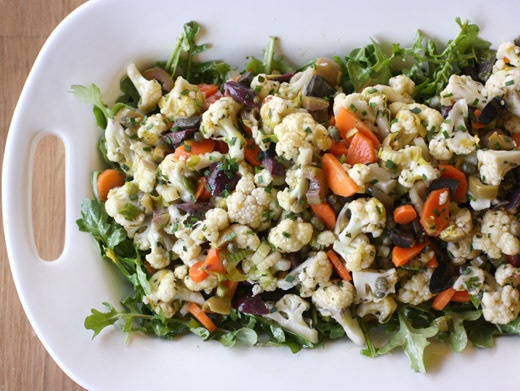 But, I was thrilled with the basic idea of this mix of marinated vegetables that could top a bed of arugula for a fresh, crunchy salad of winter produce. You’ll want to start the salad either several hours or a day before you plan to serve it. 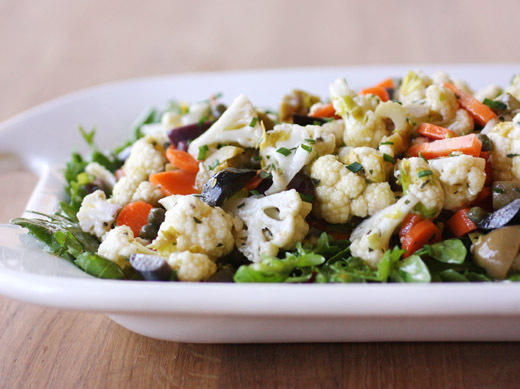 The cauliflower, carrots, and olives need some time mingle in the dressing. I served it just like it appeared in Bon Appetit on a bed of baby arugula leaves, but it’s also great by itself. Or, you could top it with some toasted pine nuts and crumbled feta. I started with a large head of cauliflower and cut the florets into pretty small pieces of about an inch or smaller. You can add the chopped vegetables to a large mixing bowl as you go. Next, a mix of olives like green and black Cerignolas and Kalamatas were pitted and roughly chopped. While shopping for these olives, I discovered that red Cerignola olives exist. I’d never seen them before. I looked it up and learned that they’re dyed red during the curing process, and I lost interest. For a moment, I thought there really was a strange, red variety of olive, but no. Carrots were sliced and celery was chopped as well. I love using the very middle stalks of celery and chopping the pale green leaves and including them too. Last, capers were drained and added to the bowl. I didn’t add any salt to the vegetables or to the dressing because of the saltiness of the olives and capers. Taste as you go to decide if you’d like any added salt. The dressing was made by whisking together apple cider vinegar, Dijon mustard, minced garlic, some fresh herbs, and crushed red pepper. Olive oil was drizzled in while whisking, and black pepper was added last. I used both chopped fresh oregano and parsley because both are currently growing in my herb garden. You could certainly skip the oregano or used dried. Half of the dressing was poured over the vegetables in the mixing bowl, and it was stirred to distribute. Cover the bowl and store the remaining dressing separately. Both should be refrigerated until ready to serve. For serving, arugula leaves were tossed with some of the remaining dressing and placed on a platter to be topped with the marinated vegetables. The marinated cauliflower keeps well in the refrigerator for several days, and I found another great use for it that I can’t wait to show. The pops of flavor put this on the opposite end of the cauliflower spectrum from a cheese-filled gratin, and that makes it a good transitional dish on our way to spring. In a small bowl or glass measuring pitcher, whisk together the vinegar, mustard, minced garlic, herbs, and crushed red pepper, and slowly drizzle in the oil while continuing to whisk until emulsified. Season with black pepper to taste. I don’t add salt here since the olives and capers add saltiness to the salad. Combine all ingredients for the marinated cauliflower in a large mixing bowl. Add about half of the dressing to the vegetables and stir to combine. Cover and refrigerate overnight or for several hours. Store the remaining dressing in the refrigerator overnight as well. If you think of it, stir the cauliflower mixture a time or two to distribute the dressing while it marinates. 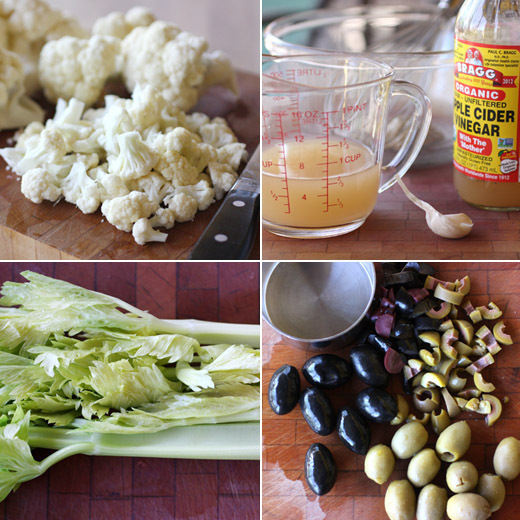 Remove dressing and marinated cauliflower mix from refrigerator about an hour before serving. Toss arugula with some of the remaining dressing and place on a platter. Top the arugula with the marinated cauliflower and serve. My husband is the cauliflower king at our house and alternates between gratin (bechamel and cheese) and salad with warmed steamed cauliflower. The bite comes from a shallot vinaigrette. I love that you add the tang and saltiness of olives and I love your dressing. Perfect. A fantastic salad! I love the fact that you've marinated the cauliflower. Wow, tasty! Yum! I'm right there with you on needing a spring-ier use for cauliflower, so I'm pinning this to soon. Our local cauliflower and broccoli season will begin again in March, just a few weeks from now. This recipe is a perfect salad of our coastal spring! I love this bright and beautiful salad, Lisa. This looks delicious and very much like spring on a plate! Mmm I can just imagine all the wonderful flavors in this salad! It's so pretty looking, too! This is Giardiniera! I love it! Sally: It is raw, but I bet you could sneak this onto his plate with all those olives and other flavors going on! Oh, I love, love all the delicious components of this salad. I'd park this in my fridge and nibble on it for every meal till it was gone! I'm definitely ready for less cheese and more fresh flavor also! What a gorgeous salad. Hi Lisa - sounds very refreshing. I like it served over arugula. Colors are great. Cauliflower is such a versatile vegetable. I even saw it used in a cheesecake dessert yesterday. What a lovely summer salad, Lisa. And the dressing adds a little kick with the mustard and red pepper. Makes a pretty presentation too. Gosh, I haven't had marinated cauliflower for years! And it takes so well to it, too. Lovely salad - such a nice combination of flavors. I haven't seen red Cerignola olives, but I wouldn't be interested in them either! About the only dye I enjoy is tandoori chicken. Anyway, really nice - thanks so much. I'm a cauliflower fan, so know I'd like this one. Thanks for testing the recipe and posting it for us. Bon Appetit gives us some good recipes. I love cauliflower any which way! It is super yummy and this looks interesting and creative! I haven't tried making cauliflower as a salad! This looks like a good recipe to start.